The Aurora Australis, otherwise known as the Southern Lights, is the lesser known counterpart to its famous alternative, the Northern Lights. 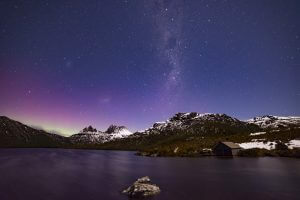 Every year people flock to Iceland and Norway to view the spectacle in the Arctic Circle, but its relatively unknown southern equal can be a surprising delight and well worth the trip to Tasmania, where it can best be viewed. 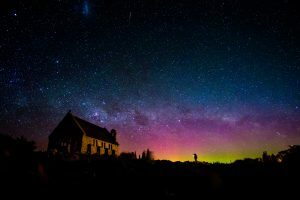 Some try their hand at catching the Aurora Australis in New Zealand and Antarctica as well. Many describe this natural phenomena as a dance of lights across the sky and a memory that will last a lifetime. This unearthly show presents itself with the sun releases a massive burst of solar wind and magnetic fields into space, otherwise known as a coronal mass ejection. Auroras are produced when the particles of these solar winds and the earth’s magnetic field collide. Therefore, Antarctica and Tasmania are the ideal places to view this natural wonder, given that the earth’s magnetic field is closest to its surface and the North and South Poles. The atoms bring various colours forth, green and red representing oxygen, and nitrogen reflected in green and blue. Although images online will present an array of dazzling colours, the naked eye typically only picks of white flashes or flickering that are sometimes mistaken for clouds. It is only once you do a long exposure with a camera that the colours come to life and vivid greens and blues present themselves. There are instances when viewing coloured light can be possible but this is rare. The lights have been described as “dancing” and making magical movements that shoot up into the atmosphere. Image thanks to Pierre Destribats. 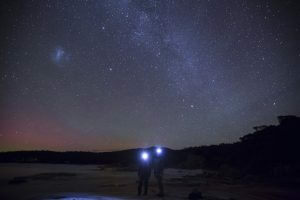 Technically a viewer could spot the lights from any clear view that’s directed south anywhere in Tasmania. You can be sure you’re looking south by searching for the Southern Cross constellation. For your best shot it’s good to stay clear of any light pollution and avoid a full moon. Other blocks such as trees and mountains should be kept at a distance as well. 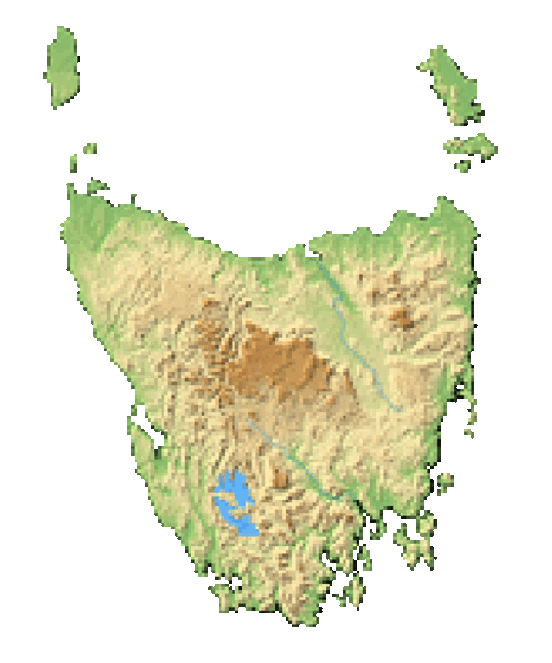 Since the further south you are, the better, popular viewing spots are South Arm Peninsula (40 km southeast of Hobart) and Cockle Creek on the southern tip of Tasmania (120 km southwest of Hobart). In South Arm Peninsula photographers rave about the reflections shots they capture, and the wide bay allows for an expansive view. Other popular sites for viewing are Dodges Ferry, Rosny Hill, Howden, Seven Mile, and Tinderbox. If you’re going to try and view closer to Hobart, try places with a broad horizon such as Mount Nelson or Mount Wellington. Both are easily accessible from the city and sometimes attract a small crowd (bring a jacket, it can get cold at night!). Luckily you have a chance at catching this entertaining light show at any time of the year, since scientific predictions can be unreliable and all it takes is the occurrence of sunspots and the coronal mass ejection to create this stellar show. This is quite special since the Northern lights have a tighter timeframe. Overall, it is quite unpredictable and sometimes space weather maps can help, but the sun will ultimately determine its arrival. Winter is ideal when the nights are longer and provide a greater window of opportunity. Some say the equinox in September is the best time but this will vary. 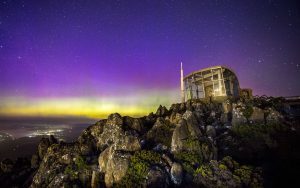 If you’re in Tassie and in the mood chase them, current updates are available on a popular Facebook page (The Aurora Australis) or you can log into any one of the apps that exist for such a purpose (Star Walk, Solar Monitor, and Aurora Australis Forecast to name a few). If you’re lucky enough to witness the event, you’ll want to be prepared and capture the image forever. An SLR camera set to manual mode with a tripod is the best way to ensure a stable and clear image. Seek out a wide lens which will allow for maximum light into the camera and choose the highest ISO (800 to 3200). The shutter speed should be anywhere from 5 to 15 seconds and the focus set to infinity. You’re all set. Happy viewing! Auroras are produced when the particles of these solar winds and the earth’s magnetic field collide.